By Ulysses S. King, Jr.
I’ve had four near death experiences in my life. All four were personal and life-changing; however, only one of those experiences involved me and my entire family. We were in a serious car accident that could have killed everyone in the car. I am truly grateful and thankful for my father and elder brother who were there to literally save my life, and the lives of my family. As I look back on those moments in my past, I am reminded of God’s divine hedge of protection that surrounded us. And when I think about how suddenly and quickly my life could have been taken from me, I am truly thankful for God’s grace and hand of mercy. The annual National Convention had just ended in Beaumont, Texas, and we were all ready to go home. My father had ministered, labored, and presided over the convention, which lasted seven days, and I could only imagine now how exhausted he must have felt. I’m sure he and my mother were anxious to get home and into their own bed. However, just before the close of the convention we received news that one of the senior mother’s of our church had passed away and we had to return home immediately to prepare for her funeral. 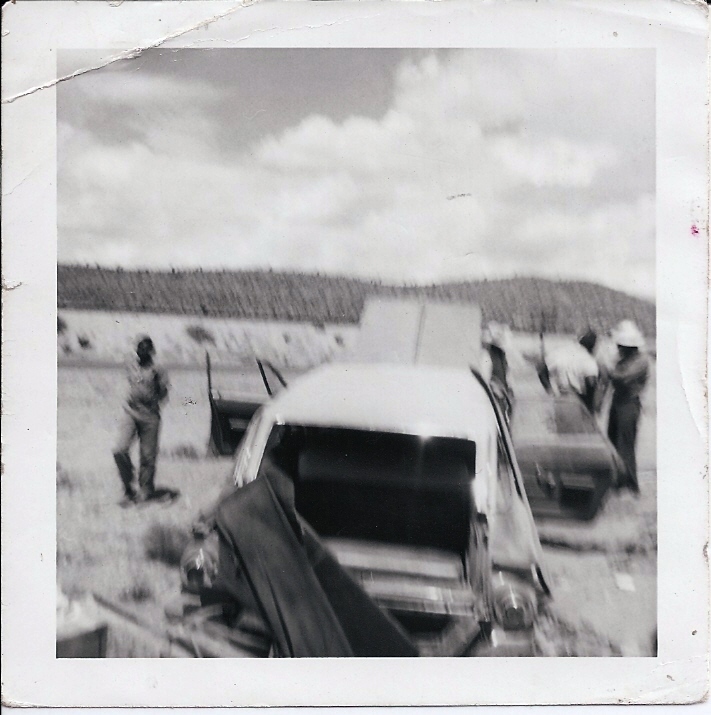 We packed our bags and loaded our luggage into the small trailer that was hooked to the back of our brown Plymouth station wagon. There were eight people in the car and hauling a small trailer to carry our luggage gave us more space and comfort for our long trip home. In the car were my mother and father; my godmother, Rhoda Mae; my elder brother, Darrel; and my two sisters, Alice and Deane; a church member and family friend, Yvonne; and me. It was also one of those rare times when my elder brother, Darrel, would travel with us. I think my father and mother didn’t want to take the chance of leaving him at home. Darrel had a way of always getting in trouble or trouble always seemed to find him. My dad sat on the front seat on the passenger’s side next to the door, and my mom sat in the middle next to the driver. I sat on the second row behind the driver along side of my two sisters, Alice and Deane. I always like to sit on the driver’s side by the door behind my father whenever he was driving. My brother, Darrel, was riding in the back seat with my godmother, Rhoda Mae. The back seat faced in reverse to the other seats. The person riding in the back seat could see nanoseconds into the past from where we had just come from. Looking back I think my father was extremely tired and trusted the only other driver in the car, Yvonne, to take his place at the wheel. He had been driving for hours and needed a break. Yvonne was only 19 or 20, and he may have taken it for granted that she may have had more experience driving than he actually knew or was aware. Her father was a farm labor contractor and owned a fleet of buses that took laborers from the city into central California to work in the fields. To my knowledge I don’t recall her ever driving a bus but she must have convinced my father that she had enough experience driving for him to allow her to drive a car pulling a trailer. It wasn’t long before reality and experience met on the road to El Paso, Texas. We weren’t far from El Paso when Yvonne pulled up behind a large tractor trailer truck on a two-lane highway. She didn’t have enough distance and space between our car and the truck in front us to be able to see the cars coming in to opposite direction. A good and experienced driver had to think fast. He or she had to be able calculate and determine the rate of speed needed to pass a 16-wheeler truck while driving a car and pulling a trailer. He or she had to also determine when it would be safe to pass and if there was enough space in front of the truck for the car and trailer once the car had pulled out and safely passed the truck. This had to all be done in an instant. A good driver had to have good vision and depth perception in cases like these. Unfortunately none of these things worked in her favor. steering wheel, which was the worst thing she could have done. Someone said that fear is the mind killer, and in Yvonne’s case fear and panic killed her instinct and ability to control the car. She was driving too close and too fast. Her response time and action created a whiplash and the car went out of control. My dad tried to reach across my mother who was sitting between them for the steering wheel, but it was too late. Like characters in a movie in slow motion I could feel the car flying in mid-air. The car and trailer flipped in the air and turned over two or three times before landing on its side off the Texas highway on the opposite side of the road in the desert. The car had no seat belts. It wasn’t until 1968 that the federal law required auto manufacturers to make cars with seat belts. It wasn’t until 1984 or 85 that states required passengers to wear them. We could have all been thrown out of the car onto the highway and ran over by oncoming cars. It was in that moment I felt my life was about to change. My father, mother, and the driver climbed out of the front window. My brother crawled out the back and helped everyone out of the mangled car. The car was lying on its side and I was lying down against the door. I heard no screams or crying. But then I felt a hand pulling me up and out of the window. It was my brother, Darrel. He didn’t call my name. He just reached down and pulled me up and out of the car. Rarely lost for words, my elder brother quietly went and sat down on the ground in the dusty, hot desert. No one was hurt. Thankfully, we were all alive. The car was totaled. People of good will stopped to assist us. The truck that we tried to pass stopped and used his CB to call for assistance. He was amazed that we weren’t all killed. We were able to get a ride to the nearest city where we took a bus home to Oakland. The emotional pain of the accident was met with the pain of racism in a small city somewhere between Fort Stockton and El Paso, Texas. A few white kids that passed us on the road who saw the accident taunted my sisters with racist epithets after we were dropped off at the bus station. No one said very much on that trip home. Everyone was quiet, tired, and still in shock that we all made it out alive. It was good to finally be going home. AT THE TIME THE CAR WENT UP IN THE AIR…..I VISUALIZED TWO HANDS CARRYING IT AND LETTING IT REST ON THE SIDE OF THE ROAD. PRAISE GOD FOR HIS HANDS OF PROTECTION!